Since mammography breast cancer screening has been disappointing, maybe this is not a bad idea. Would population screening for deleterious BRCA gene mutations lead to reduced mortality ? These studies have not yet been done, so we don’t know yet. Research on this is still in its infancy, and the gene testing technology is racing forward with testing costs cheaper every year. Angelina revealed in her op-ed that she was now taking hormone replacement for surgically induced menopause. Angelina mentions an estrogen patch. (This sounds like it could be the 17-Beta-Estradiol patch, Climara or Vivelle). Angelina also revealed she uses a “progestin” impregnated IUD. (This sounds like the Mirena which has a synthetic chemically altered “progestin” levonorgestrel). I assume the Mirena IUD is to prevent endometrial hyperplasia and risk of endometrial cancer. I would not recommend the Mirena IUD because it contains the synthetic progestin, levonorgestrel. Synthetic progestins such as levonorgestre cause adverse effects of migraine headache, acne and hair loss. There may be an association with breast cancer, (for those who still have breast tissue). For more on adverse side effects of synthetic progestins, see my article on this topic. Another adverse side effect of the Progestin impregnated IUD is perforation of the uterus. About 700 cases of per uterine perforation were reported in this report. Some women dislike the Progestin impregnated IUDs because of adverse effects of unscheduled bleeding, abdominal pain, weight gain, mood disturbance, etc. Only half the women responded they were satisfied with this IUD. Instead of the Estradiol patch and Mirena IUD combination, I would recommend a more bioidentical approach. I would prescribe a topical cream containing both Estradiol and Estriol (called Bi-Est), as well as progesterone in the same cream. In addition, oral progesterone capsules at night before sleep are also given. We routinely do periodic hormone testing with either blood testing or 24 hour urinary metabolites. Annual pelvic sonograms are useful to measure endometrial thickness. Progesterone is FDA approved for prevention of endometrial hyperplasia and will maintain a thin endometrial lining. Any increase in endometrial thickness has further evaluation. see this link: FDA Approval of Progesterone Prevents Endometrial Hyperplasia. Left image Mirena IUD. About 30-50% of BRCA carrier women decline the surgical procedures offered by mainstream medicine. (24) Reasons are unclear. However some women do not trust the medical system and wish to avoid ‘self-mutilation”. Others may have benign or clinically insignificant BRCA mutations which do not require heroic measures. For BRCA carrier women who decline preventive surgery, Mainstream Medicine offers more intensive surveillance with imaging and blood testing, mammograms, MRI scans for breast cancer surveillance. For ovarian cancer surveillance they have the CA-125 cancer marker test and pelvic and transvaginal sonogram . These types of surveillance programs have not proven to be reliable, as they may fail to detect ovarian cancer until after the cancer has spread throughout the peritoneal cavity, and to distant organs. The BRCA gene is involved in repairing oxidative damage to DNA using the seleno-protein repair system. The BRCA mutation carries the inability to repair double stranded DNA breaks. Increased markers of oxidative DNA damage can be measured in BRCA gene carriers. Selenium supplementation not only reduces the oxidative damage markers, it also reduces the incidence of breast cancer in the BRCA carrier to that of normal siblings. 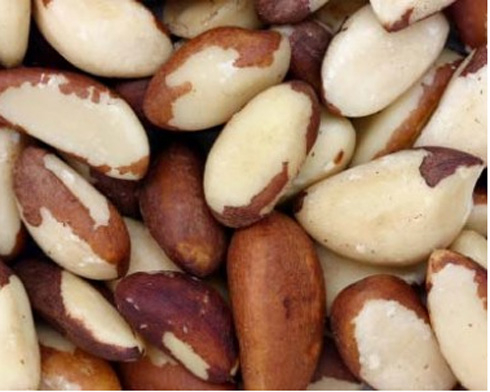 (11-15) Left image Brazil Nuts High in Selenium. Dziaman et al. from Poland published a study in Nov 2009 looking at DNA damage in BRCA gene carriers. (12) The authors measured serum and urinary products of DNA oxidation with and without selenium supplementation, finding damaged DNA products were higher in BRCA mutation carriers, and markers were reduced by selenium supplementation. Their results suggest that BRCA1 deficiency contributes to oxidative damage and breaks in cellular DNA, which may be responsible for cancer development. In addition, selenium supplementation is beneficial, because it protects the DNA from oxidative damage. A study of BRCA gene carriers from Kowalska in Poland in 2005 provides strong evidence for selenium as a preventive agent. (13) Fifty five women with the BRCA1 gene mutation were supplemented with 275 µg of sodium selenite daily for 8 weeks. The amount of DNA damage was assessed from blood lymphocytes. This showed BRCA gene carriers had twice the DNA damage compared to their normal siblings. However, Selenium supplementation given to BRCA gene carriers reduced the DNA damage to normal levels, same as normal siblings. Left Image human lymphocyte courtesy of Wikimedia commons. Since selenium supplementation has no adverse effects, it would be prudent for all BRCA gene carriers to supplement with seleno-methionine (200-400 mcg/day). (11-14) We monitor serum selenium levels for safety. We have yet to see studies examining the effect of selenium supplementation on mortality reduction in BRCA carriers. We simply do not know how selenium supplementation compares with preventive surgery offered by mainstream medicine, and this would be a fertile area for future study. In an article entitled, Cancer As a Metabolic Disease, we discuss a number of nutritional supplements available at the health food store which have strong anti-cancer activity. These include Resveratrol, Pterostilbene, Chinese Skullcap, Curcumin, Betulinic acid, Berberine, Artemesinin, Vitamin K2 , and Methyl Jasmonate. These types of natural substances induce apoptosis in cancer cells via the Hexokinase pathway. There are many others. A program including some of these supplements would be advisable for the BRCA gene carrier. Iodine supplements, available at any health food store, represent another cancer preventive intervention for high risk women who decline preventive surgery. Iodine deficiency is a risk factor for fibrocystic breast disease and breast cancer. My previous article discussed this: Iodine Deficiency and Breast Cancer. How can we explain the discrepancies and inconsistencies in BRCA Gene studies? I suggest this is explained by the hundreds of variations in the BRCA gene mutations. Only a few are deleterious leading to aggressive cancers with poor prognosis. Many of the BRCA variations are benign of no clinical significance. In order to determine if the BRCA gene mutation is clinically significant, additional testing may prove useful to determine downstream functionality of the DNA repair mechanism disrupted by the BRCA mutation. One such test, the lymphocyte Bleomycin assay, was used by Dr. Kowalska in her study to measure functionality of the DNA repair mechanism before and after selenium supplementation. In another study, Dr. Dzamian measured DNA products of oxidation in the blood and urine. He measured 8-oxodG levels in cellular DNA and urinary excretion of 8-oxodG and 8-oxo-7,8-dihydroguanine (8-oxoGua). These are markers of DNA oxidative damage indicating dysfunctional DNA repair mechanism. As yet, these are advanced tests for the research setting. Hopefully, similar tests for the clinical setting will be developed in the future. This highlights the complexity and pitfalls of genetic screening for BRCA gene mutations. It would be unwise to undergo self testing with an online genetic testing service, which then yields a positive BRCA result, and then present oneself to a surgeon for preventive surgery. The BRCA mutation may be clinically insignificant, not requiring heroic measures. Evaluation by an expert genetic counselor is key here. This is a health professional who gathers all the pieces of the puzzle and puts them together. The genetic counselor considers the severity of the BRCA mutation, whether deleterious or benign, along with family history to hopefully arrive at a valid risk estimate and treatment recommendation. Where are the Homozygous BRCA Gene Cases? You might be wondering why none of the BRCA gene studies include homozygous BRCA gene cases. All women are BRCA carriers indicating heterozygous state. Where are the homozygous BRCA gene cases ? Homozygous BRCA is lethal in the embryo, so we don’t have any. “Color Genomics is offering a $249 saliva test kit for women that will check for 19 genetic variants known to be correlated with a higher risk of breast cancer or ovarian cancer, including mutations in the BRCA1 gene,” from Bloomberg Business. Angelina Jolie Pitt: Diary of a Surgery By ANGELINA JOLIE PITTMARCH 24, 2015 New York Times… My major “quibble” with the Angeline Jolie case is the use of “progestin” impregnated IUD (probably a Mirena IUD) which I do not recommend. I would use real progesterone instead. Ms. Jolie Pitt is a remarkable individual who is to be applauded for sharing with the world her experiences. In doing so, she has almost certain saved more lives than any single physician may in a lifetime of practice. Thank you for your honesty and the education you have provided women everywhere. I admire you greatly for your courage and advocacy for women (and men). Thank you. “We do not know whether Ms. Jolie is on an FDA-approved product, or an compounded one,” said Pauline M. Maki, president of the North American Menopause Society. “Given that she is using a patch, it is likely an FDA-approved form.” An earlier version of this story reported that compounded hormones do not require a prescription. This version of the story has been updated to report that they do. Domchek, Susan M. “Evolution of Genetic Testing for Inherited Susceptibility to Breast Cancer.” Journal of Clinical Oncology (2014): JCO-2014. Finch AP, Lubinski J, Møller P, et al. (2014) Impact of oophorectomy on cancer incidence and mortality in women with a BRCA1 or BRCA2 mutation. J Clin Oncol 32:1547–1553. We confirm here the impact of oophorectomy on mortality in our study of 5,783 carriers, and we report that the effect of oophorectomy on all-cause mortality is equally strong for BRCA1 (HR, 0.30; 95% CI, 0.24 to 0.38) and BRCA2 mutation carriers (HR, 0.33; 95% CI, 0.22 to 0.50). Women without a history of breast cancer may be administered hormone replacement therapy for the relief of the acute symptoms of menopause without increasing their risk of breast cancer. 14.? Rebbeck TR, Friebel T, Wagner T, et al. (2005) Effect of short-term hormone replacement therapy on breast cancer risk reduction after bilateral prophylactic oophorectomy in BRCA1 and BRCA2 mutation carriers: The PROSE study group. J Clin Oncol 23:7804–7810. Eisen A, Lubinski J Gronwald J, et al. (2008) Hormone therapy and the risk of breast cancer in BRCA1 mutation carriers. J Natl Cancer Inst 100:1361–1367. Domchek, Susan M., et al. “Association of risk-reducing surgery in BRCA1 or BRCA2 mutation carriers with cancer risk and mortality.” Jama 304.9 (2010): 967-975. Context Mastectomy and salpingo-oophorectomy are widely used by carriers of BRCA1 or BRCA2 mutations to reduce their risks of breast and ovarian cancer. Objective To estimate risk and mortality reduction stratified by mutation and prior cancer status. Design, Setting, and Participants Prospective, multicenter cohort study of 2482 women with BRCA1 or BRCA2 mutations ascertained between 1974 and 2008. The study was conducted at 22 clinical and research genetics centers in Europe and North America to assess the relationship of risk-reducing mastectomy or salpingo-oophorectomy with cancer outcomes. The women were followed up until the end of 2009. Main Outcomes Measures Breast and ovarian cancer risk, cancer-specific mortality, and overall mortality. Results No breast cancers were diagnosed in the 247 women with risk-reducing mastectomy compared with 98 women of 1372 diagnosed with breast cancer who did not have risk-reducing mastectomy. Compared with women who did not undergo risk-reducing salpingo-oophorectomy, women who underwent salpingo-oophorectomy had a lower risk of ovarian cancer, including those with prior breast cancer (6% vs 1%, respectively; hazard ratio [HR], 0.14; 95% confidence interval [CI], 0.04-0.59) and those without prior breast cancer (6% vs 2%; HR, 0.28 [95% CI, 0.12-0.69]), and a lower risk of first diagnosis of breast cancer in BRCA1 mutation carriers (20% vs 14%; HR, 0.63 [95% CI, 0.41-0.96]) and BRCA2 mutation carriers (23% vs 7%; HR, 0.36 [95% CI, 0.16-0.82]). Compared with women who did not undergo risk-reducing salpingo-oophorectomy, undergoing salpingo-oophorectomy was associated with lower all-cause mortality (10% vs 3%; HR, 0.40 [95% CI, 0.26-0.61]), breast cancer–specific mortality (6% vs 2%; HR, 0.44 [95% CI, 0.26-0.76]), and ovarian cancer–specific mortality (3% vs 0.4%; HR, 0.21 [95% CI, 0.06-0.80]). Conclusions Among a cohort of women with BRCA1 and BRCA2 mutations, the use of risk-reducing mastectomy was associated with a lower risk of breast cancer; risk-reducing salpingo-oophorectomy was associated with a lower risk of ovarian cancer, first diagnosis of breast cancer, all-cause mortality, breast cancer–specific mortality, and ovarian cancer–specific mortality. If your goal is to reduce mortality from breast cancer , then throw away into the garbage can screening mammography, and instead screen the population for the BRCA gene…..offer surveillance or treatment options to these patients who are BRCA gene positive. …they decide what treatment they want …I guarantee you national annual breast cancer mortality will decline precipitously. We have other examples of familial cancer formers such as hereditary colonic polyposis. These people harbor numerous colonic polyps which transform into colon cancer. Colonoscopy is curative. It runs in families. Yet the mortality reduction with surgical treatment of BRCA gene positive women is real and not to be ignored. Reduction in cancer mortality is tough to find in mainstream medicine. When we find something that give us a mortality reduction, we should say , “good job” and give some encouragement. in BRCA gene women who have increased mortality from breast / ovarian cancer compared to their normal siblings, yes, prophylactic mastectomy and oophorectomy translates into reduced cancer mortality and reduced all-cause mortality. We have the data for that. The Myriad patent on the BRCA test has been overturned by the court, so costs have come down as competitors offer the test. Bilateral prophylactic salpingo-oophorectomy (BPSO) is used widely used to reduce the risk of breast and ovarian cancer in women with BRCA1 and BRCA2 mutations. However, the reduction in mortality after this surgery is unclear. We aimed to assess whether BPSO improves overall mortality or cancer-specific mortality in BRCA1 and BRCA2 mutation carriers. We identified a prospective cohort of 666 women with disease-associated germline mutations in BRCA1 or BRCA2 and no previous cancer diagnosis. In our primary analysis, we compared 155 women who had had BPSO and 271 women matched for age at BPSO who had not had BPSO. In our secondary analysis, we compared 188 women who had had BPSO with 478 women who had not. In both analyses, we compared overall mortality and cancer-specific mortality. All analyses were adjusted for centre, mutation (BRCA1 vs BRCA2), and birth year. In the primary analysis, mean follow-up from BPSO to censoring was 3·1 years [SD 2·4] in the BPSO group and 2·1 years [2·0] in the non-BPSO group. The hazard ratio (HR) for overall mortality was 0·24 (95% CI 0·08–0·71), for breast-cancer-specific mortality was 0·10 (0·02–0·71), and for ovarian-cancer-specific mortality was 0·05 (0·01–0·46) for women who had BPSO compared with those who had not. In secondary analysis, BPSO was associated with reduced overall mortality (HR 0·28 [95% CI 0·10–0·74]), but not with breast-cancer-specific mortality (0·15 [0·02–1·18] or ovarian-cancer-specific mortality (0·23 [0·02–1·87]. When regarded as a time-dependent covariate, BPSO was not associated significantly with mortality. If confirmed, the finding that BPSO improves overall survival and cancer-specific survival in women with BRCA mutations will complement our existing knowledge of cancer-risk reduction associated with BPSO. Together, these data could give information to women who are considering genetic testing. King, Mary-Claire, Ephrat Levy-Lahad, and Amnon Lahad. “Population-based screening for BRCA1 and BRCA2: 2014 Lasker Award.” JAMA 312.11 (2014): 1091-1092. Families were identified by recruiting more than 8000 healthy Ashkenazi Jewish men. Each male index participant was screened for 3 loss-of-function mutations that collectively account for the great majority of inherited cancer risk due to BRCA1 and BRCA2 in this population. BRCA1 and BRCA2 mutations are equally common in women and men and are inherited equally from mothers and from fathers. Men were tested as a gateway to families because men were unaffected by breast cancer themselves, thus enabling female mutation carriers to be identified only by relationship to a healthy male relative, not based on their personal or family history of cancer. By multiple criteria, the index men were representative of their population with respect to mutation prevalence and family history. For each of the 175 men identified as a carrier of a mutation in BRCA1 or BRCA2, genetic testing was offered to all female relatives. In the United States as a whole, the number of carriers of actionable mutations in BRCA1 and BRCA2 carriers is estimated to be between 1 in 300 and 1 in 500 women,6 or between 250 000 and 415 000 adult women for whom breast and ovarian cancer is both highly likely and potentially preventable. Cancer Causes Control. 2010 Jan 9. Toenail selenium status and DNA repair capacity among female BRCA1 mutation carriers. Kotsopoulos J et al. Selenium is an important cofactor of various antioxidant enzymes and has been shown to enhance DNA repair in normal human fibroblasts. Oral selenium supplementation has also been shown to decrease the number of chromosome breaks in BRCA1 mutation carriers. Because the predisposition to cancer among BRCA1 mutation carriers may be linked to high rates of DNA damage and chromosome breakage, we evaluated the association between toenail selenium concentrations and three measures of DNA repair capacity (the single-cell alkaline gel electrophoresis (comet) assay, the micronucleus test, and the enumeration of gamma-H2AX nuclear foci) in female BRCA1 mutation carriers and in non-carriers. Toenail selenium levels were inversely associated with levels of chromosomal damage following exposure to gamma-irradiation, as assessed by the micronucleus test. This association was limited to women with a BRCA1 mutation (p = 0.03). These results provide evidence for a possible protective effect of selenium against BRCA1-associated breast cancers. Cancer Epidemiol Biomarkers Prev. 2009 Nov;18(11):2923-8.Selenium_Reduced_DNA_Damage_BRCA_Carriers Selenium supplementation reduced oxidative DNA damage in adnexectomized BRCA1 mutations carriers by Dziaman T et al. Poland. 14) http://www.hccpjournal.com/content/4/1/58 Huzarski, Tomasz, et al. “A lowering of breast and ovarian cancer risk in women with a BRCA1 mutation by selenium supplementation of diet.” Hereditary cancer in clinical practice 4.1 (2006): 58. 15) A Lowering of Breast and Ovarian Cancer Risk in Women with a BRCA1 Mutation by Selenium Supplementation of Diet. Huzarski T1, Byrski T, Gronwald J, Kowalska E, Zajaczek S, Górski B, Huzarska J, Cybulski C, Narod SA, Lubiński J. Author information 1International Hereditary Cancer Center – Department of Genetics and Pathology, Pomeranian Medical University, Szczecin, Poland. Hered Cancer Clin Pract. 2006 Jan 15;4(1):58. Lin, Cheryl, et al. “The case against BRCA 1 and 2 testing.” Surgery 149.6 (2011): 731-734. Am J Med Genet A. 2010 Jan; 152A(1): 52–66. what alternatives can be offered BRCA gene carriers? The answer is the supplement, selenium. This entry was posted in BRCA Gene, Breast Cancer, Genetic Testing, jeffrey dach, Ovarian Cancer and tagged Angelina Jolie, BRCA, breast cancer, ovarian cancer by Jeffrey Dach MD. Bookmark the permalink.